According to the Office of Auditor General (OAG) report, telecom companies in Nepal are earning a huge margin due to their expensive tariff. Publishing the 56th Annual report, Auditor General Tankamadi Sharma says the operating profit of Nepali Telecom service providers is highest in the world. High margin is due to the expensive telecom service, which mars the people’s demand for easy and affordable access to information. People have been complaining a lot about the expensive tariff of the telecom services in Nepal. One survey was done earlier which showed how people feel for mobile data. The latest report by OAG reflects the situation of Telecom services here. OAG had made a comparison of the profit made by Telecom companies here to that of worldwide. With which, they found Nepali companies to have gained a huge operating profit out of their services. People are bound to use the expensive services while the margin for the telecom companies is huge. So, they felt the consumer’s right is not protected in the case of Telecom services. According to them, any products/services shall be priced according to the different expenses for operation, infrastructure investment and certain profit. Likewise, such price also has to be in line with the profit made by similar nature international companies. They made a comparison of this value with other countries which shows Malaysia also has a profit of 37.8 percent, that is maximum among those countries. Similarly, Germany has been providing services at just 24 % profit margin. In the report, they showed the huge revenue margin of two telecom service providers namely Nepal Telecom and Ncell. The profit margin for Nepal Telecom is 58 percent whereas that of Ncell is 62 percent. OAG report also pointed out the regulator NTA’s role has not been analytical in this regard. Therefore they recommend NTA-Nepal Telecommunication Authority and line Ministry MoCIT to regulate the price of Telecom services in Nepal. It is only possible with continuous monitoring and decreasing the profit margin of telecom companies. The reasons for such huge margin could be either due to the mammoth revenues from International call termination which has no impact on the local people. Similarly, the price may have been not competitive due to the duopoly of the telecom operators NTC and Ncell. They have been milking the duopoly status due to the absence of another nation wide operator. Read How many Telecom companies are needed in Nepal? In the same report, OAG has recommended another issue to impose a tax on social networks like Facebook, Twitter and more. 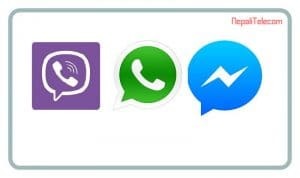 Several OTT applications like Messenger, Viber, WhatsApp contribute to the loss of revenue for the telecom operators and Government (due to the tax). Read here: OTT apps trouble telecom companies in Nepal. As these social networking sites do not pay tax here, a huge sum of money evades out of Nepal with the widespread usage here. The local advertisement done with these social networking platforms is also not under the scope of local taxes. So to increase the country and telcos revenue, AGO recommends bringing those social networks under the scope of tax here in Nepal. Nepal Government has already initiated the effort to make a provision for the social network sites to register in Nepal. This is a part of the Information and Technology Management bill under discussion in Parliament. They believe this provision will certainly help to regulate the social network sites and bring them under the tax net. OAG report has also shown the dues to be cleared from the telecom companies, pending from some years. They direct the Nepal Telecommunication Authority (NTA) to recover that huge amount from the telcos. Among the telcos, Smart Telecom, UTL and Nepal Satellite have a huge amount to pay to the Government in the name of Renewal fees, RTDF fees, Frequency fees, and Royalty fees. Find the pending fees from the Telcos here. NTA can even cancel the licenses if they are unable to pay the amount. NTA has already set a deadline to clear the dues, after which they will move ahead to cancel the license. What do you think of the recommendations by the 56th Auditor General office Report?? Please feedback in the comment section below. 45 percent people feel mobile data is expensive in Nepal. Telecom operators/companies of Nepal: Which operator/SIM card to buy/choose?